Jimmy Buffett was excited to be in Australia, and Australians were excited to see the soft-rock superstar perform his easy-going tropical hits, like Margaritaville and Cheeseburger in Paradise. 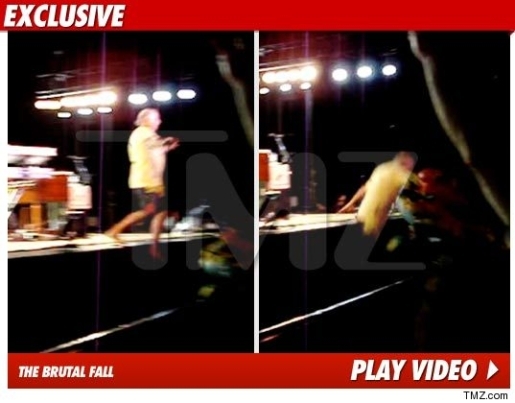 However, perhaps the excitement was too much for 64-year-old Buffett, as flashing stage lights got him disoriented and the flip-flop-wearing singer walked off the stage, falling into the first row of fans and injuring himself. Jimmy Buffett fell into the first row at a concert in Sydney’s Hordern Pavilion after walking off the stage during an encore. TMZ has video of the incident. Fans in attendance were told to go home while an ambulance whisked Buffett away to nearby St. Vincent’s Hospital, where he was examined for injuries and is being held for observation. He is in stable condition. The fall took place at Buffett’s Australia Day concert, marking the singer’s first Australian tour in 20 years. A similar on-stage faceplant happened to Aerosmith lead singer Steven Tyler. If history holds true, that means Jimmy Buffett will be a judge on American Idol next year.